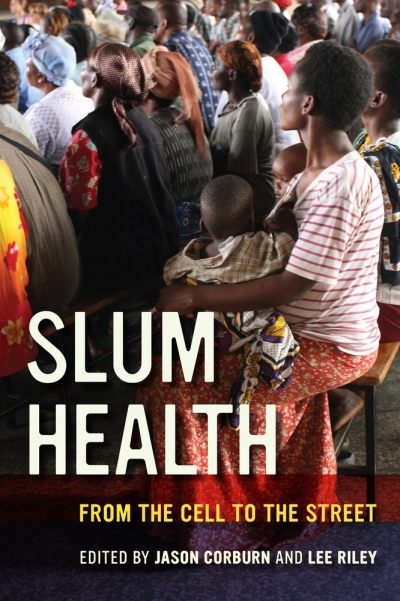 Update (8/2/16): New Slum Health book published by UC Berkeley faculty, Lee Riley and Jason Corburn. Globally, more than a billion people reside in urban slums. Residence in slums is a risk factor for a variety of adverse health outcomes. Diseases of slum residents that are eventually recognized by the formal health sector are often those that are complications or sequelae of preventable illnesses. As such, slum dwellers are likely to live longer with disability (years lived with disability or YLD) or likely to have more years of life lost (YLL) than non-slum residents when they develop the same disease or injuries. In many nations, slum residents are not officially recognized (no work permit, no home address, no identification card, and in some places, no birth or death certificates) and hence the allocated resources do not take into consideration the cost to take care of this population. New metrics specific to slums need to be developed and used to assess the impact of interventions on disease/injury-related morbidity and mortality, as well as to allocate more realistic resource needs. Health inequity in the world’s burgeoning slums is the product of numerous complex social, physical, economic, and political factors. The search for solutions requires better data on the burden of disease morbidity and an integrative understanding of determining factors, matched by creative multidisciplinary insights, tools and methodologies to design interventions. A multidisciplinary group of faculty and students associated with UC Berkeley’s Center for Global Public Health is defining a new, forward-looking research agenda on slum health. CGPH facilitates development of the slum and urban health agenda by facilitating faculty/student research activities representing diverse disciplines (i.e., Infectious Diseases, Civil Engineering, City Planning, Community Health/Human Development, Public Health). Rio de Janeiro Slum Health Initiative: New programs are being developed in Rio de Janeiro to address inadequate infrastructure, poverty, crime, social exclusion and general health and well-being in the city’s favelas in advance of upcoming World Cup and Olympic events. Impact data from differential interventions combined with robust information on targeted communities provides a natural experiment capable of generating valuable lessons for future interventions in Rio and elsewhere. Review of non-health specific policies since ~1990 aimed at improving living conditions and poverty in Rio’s favelas to document the range of overlapping policies that either explicitly or implicitly are trying to address the social determinants of health. Identifying which favelas in Rio (of over 200) received interventions/resources from these policies and what happened; selecting a subset of favelas where data is available from a cohort study directed by collaborator Dr. Faerstein and analyze population health changes from 1999 (1st wave) to 3rd wave (2009) in the selected favelas. We are collaborating with Bolsa Familia to examine intra-urban differences in outcomes for families living in different favelas using data from the First Intra-urban Study of Bolsa Familia in Brazil. CGPH steering committee member, Professor Lee Riley, leads the Global Health Fellows and Scholars Research and Training program, which focuses on Slum Health.